With technology evolving and the growing interconnection of cultures and countries, change is inevitable. This holds true for people in all walks of life. Unfortunately, not everyone is equipped personally or professionally to effectively adapt to these changes. And other than encouraging words, there is currently little to help individuals design a way out of this predicament. Enter Georges Philips’ latest entrée into the realm of therapeutic psychology. Understanding that change requires directing and that without it, it will continue to produce the same behaviors and results it has always produced, he has written a very practical book on the process of manifesting a positive new direction in life. You can analyze the past, he says, but you must design the future, and any resistance to doing so is fear-based. To relinquish this grip of fear, the book’s straightforward language and methodical, step-by-step approach is easily understood and non-threatening. From analyzing different situations involving change to going through the specific thinking and action steps needed in order to change direction, every detail and each step is clear and powerful. In the end, it is your thinking fuelled by your determination that brings about a change of direction. click here to visit the dedicated Change Directions websiteA powerhouse of personal and professional fulfillment, Philips’ newest offering makes the process of understanding ourselves and our behaviors shockingly obvious and eminently comprehensible. By simplifying the process into practical bullet points that are readily understood and applied, he puts improvement within reach for anyone interested in maximizing their potential. These practical, easy-to-understand steps can transform both your personal and professional lives as fast as you are capable of applying them. 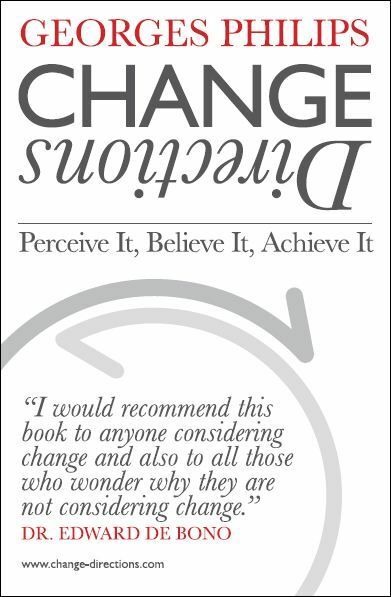 Change Directions: Perceive it, Believe it, Achieve it is as engaging as it is encouraging and enlightening, reminding us all that the one person who can make the greatest difference in our lives is ourselves.